Pumpkin Pie – This is exactly what you would want out of a real pumpkin pie. Neither the pumpkin flavor nor the spices overpower each other. There is a 50/50 complimentary split between both aspects in the protein powder. If you want to get the best of both worlds in a pumpkin protein powder Primeval Labs hit the nail on the head. Every single aspect you could think of (besides the whip cream and crust) in a pumpkin pie was on point. Primeval Labs continues to impress me with their flavoring. 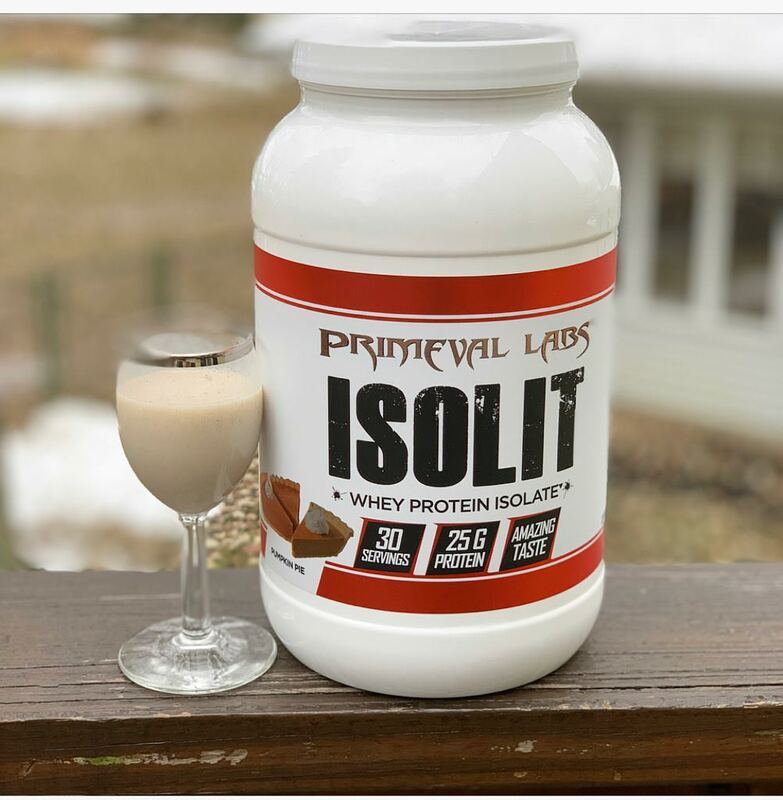 Isolit is a pure isolate protein powder. The texture of the powder is very thin and mixes upon touching the liquid. Given the makeup of the profile it mixes thicker than I expected. Added Xanthan Gum could be a big reason for the added thickness for a pure WPI protein powder. I varied 4-6-8oz of liquid and found no issues with any amount. The less amount of liquid you use the stronger the flavor will be. I also enjoy mixing protein powder into Greek Yogurt. I mix 1 scoop of Isolit into 6oz of Greek yogurt and found it to have no issues when stirred with a spoon. ISOLIT is a 100% pure whey protein isolate protein powder that mixes easily and tastes absolutely delicious. ISOLIT is derived from exceptionally high-quality milk, and by using only whey protein isolate, we’ve maximized protein content per scoop while limiting carbohydrates and fat. 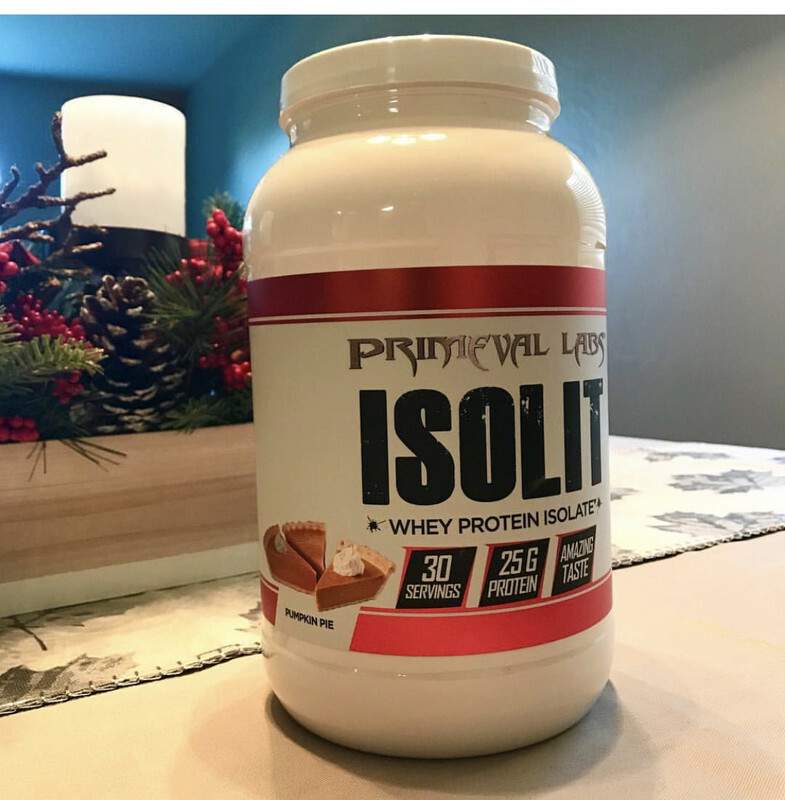 Primeval Labs Isolit retails around $40 for a 2lb tub. This is not including coupons and discounts you can find from online retailers. Given Primeval Labs track record on flavoring you are dealing with a high quality WPI protein powder. This is one of those products of you get what you pay for. The company is exceptional at flavoring, and this carries over into their protein powder just like EAA Max, Mega Pre, Mega Pre Black, and the rest of their line-up. The added digestive enzyme causes no bloat and goes down very easy that is just the icing on the cake to prevent bloating or GI issues.